This fly-through of the Gum Nebula into the Westerlund stellar cluster is beautiful, epic, and the perfect way to celebrate 25 glorious years of the Hubble Space Telescope imaging our awe-inspiring universe. To celebrate Hubble’s milestone 25th anniversary, NASA has released an all-new image of Westerlund 2, a cluster embedded within the Gum 29 nebula. Even better, they’ve created a fly-through of the nebula. This is the perfect way to explore this gorgeous astronomical object with distances compressed so you can soar through the wispy clouds and around the dense columns within a reasonable human timeframe, and without getting fried by the intense radiation. The Gum 29 nebula is a stellar breeding grounds about 20,000 light years away in the constellation Carina. As new stars ignite, they clear out surrounding dust, and drive shockwaves into pillars of existing dust. These shockwaves can be enough to trigger critical collapses, forming new stars in a propagating sequence of stellar birth within the nebula. 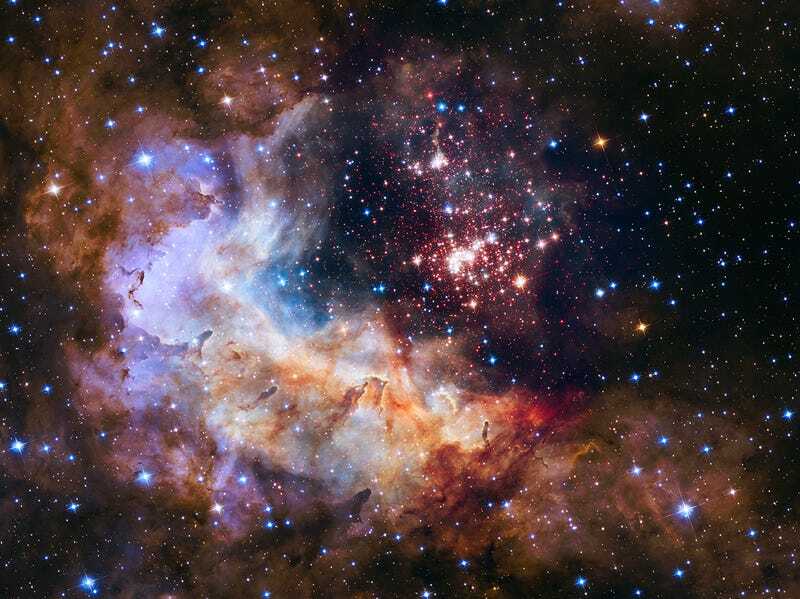 The Westerlund 2 stellar cluster is about 3,000 young stars nestled within the Gum 29 nebula. The young, bright Westerlund 2 cluster is small, young, and beautiful. The cluster contains about 3,000 stars, most under 2 million years old and still clearing out their enveloping clouds of hydrogen gas with savage winds of charged particles and brutally high-energy ultraviolet light. As the gas is compacted into denser columns, the shockwaves spark the birth of even more new stars. The brightest stars are in the foreground, somewhere in the 20,000 light years between our Milky Way and the Westerlund 2 cluster. Hubble sees farther and fainter than our eyes, and also a little bit outside our optical spectrum. The near-infrared band is perfect for picking up these tiny red stars. At barely 1 to 2 million years old, these stars are babies in the stellar nursery still swaddled in thick cocoons of dust. Soon, they’ll start burning the hydrogen in their cores, heating up and producing the same intense radiation and torrent of high-energy particles as their older stellar siblings in the cluster. These bright, young red stars were formed by shockwaves collapsing thick pillars of gas and dust. This is what I truly love about the Hubble Space Telescope. Of all of NASA’s Great Observatories, Hubble is the only one that fixates on the visible spectrum. While the long exposure times and incredible sensitivity take its capacity way beyond what a human eye is capable of, Hubble is for all intents our observational proxy, seeing what we could see, but better. The wispy blue indicates more oxygen-rich gas than the filaments of dense brown dust and other gases.